Who Watches The Social Justice Activists? I just sort of glanced past this in my post about Laci Green, but I think it’s worth circling back for. I mentioned that, as of the post, Green’s latest thing was ranting about this tweet. Shakur, also known as Joanne Chesimard, was convicted of killing a cop in 1973, but managed to escape and is presumed to be alive and hiding in Cuba. The FBI made news when they semi-recently put her on a list of known terrorists, and offered two million dollars for information about her or assistance in capturing her. “This case is just as important today as it was when it happened 40 years ago … Bringing Joanne Chesimard back here to face justice is still a top priority,” said Mike Rinaldi, a lieutenant in the New Jersey state police and member of a joint terrorism task force in Newark. Scary stuff. But to fully put this in perspective, we have to take a step back to discuss a thing known as COINTEL or COINTEL-PRO. I had been active in the New Left and the women’s liberation movement in the late 1960s and early 1970s, so I thought, well, maybe there will be a mention or two of my name somewhere. I had underestimated the U.S. government’s interest in my life. Six hundred and forty-six pages had been compiled about me by various agencies of the U.S. Department of Justice.’ Files on me-referred to as “Subject”-existed at FBI Headquarters and at FBI field offices in New York City, Newark, San Diego, Milwaukee, Pittsburgh, Washington, D.C., and Boston. That’s Roberta Salper, who the FBI labeled a “domestic subversive” because she talked about socialism and seemed to carry some political clout. In hindsight, her views are remarkably tame. Looking back, I am heartened that much of what we advocated has become standard fare: full-fledged women’s studies programs across the nation, university-based daycare, certain links to the community, important pedagogical reforms. What didn’t endure, however, was the vision we had. We didn’t want just isolated (albeit important) reforms like equal pay for female faculty and access to administrative power. We wanted to change the structure in which education functioned, and for that we had to campaign against corporate control of higher education and, by extension, of other sectors of the country. The fight against corporate control was at the crux of the struggles that took place during the first year of the first women’s studies program. But nonetheless, the FBI expended quite a bit of time and money trying to swat down these “radical” ideas. Salper was lucky, because this branch of the FBI also tried to blackmail Martin Luther King Jr. into suicide. They also created the environment that led to Malcom X’s assassination. By the point of Malcolm’s assassination during a speech in Harlem on the night of February 14, 1965, the FBI had compiled at least 2,300 pages of material on the victim in just one of its files on him, the NoI and the OAAU. Malcolm X was supposedly murdered by former colleagues in the NoI as a result of the faction-fighting which had led to his splitting away from that movement, and their “natural wrath” at his establishment of a competing entity. However, as the accompanying January 22, 1969 memo from the SAC [Special Agent in Charge], Chicago, to the Director makes clear, the NoI factionalism at issue didn’t “just happen.” Rather, it had “been developed” by deliberate Bureau actions – through infiltration and the “sparking of acrimonious debates within the organization,” rumor-mongering, and other tactics designed to foster internal disputes – which were always the standard fare of COINTELPRO. The Chicago SAC, Marlin Johnson, who would shortly oversee the assassinations of Illinois Black Panther Party leaders Fred Hampton and Mark Clark, makes it quite obvious that he views the murder of Malcolm X as something of a model for “successful” counterintelligence operations. This isn’t the ramblings of conspiracy nutters, either; the FBI themselves host an archive of declassified documents from COINTEL-PRO, so you can double-check the basics. Digging further, we find they deliberately abused the court system. Even in the case of Maxwell Sanford’s Revolutionary Action Movement (RAM), which had never offered professions of pacifist intent, Hoover was forced to admit that his agents had turned up no hard evidence of violence or other criminal activities. Rather, the director points with pride to an anti-RAM COINTELPRO operation undertaken during the summer of 1967 in which RAM members were “arrested on every possible charge until they could no longer make bail” and consequently “spent most of the summer in jail,” even though there had never been any intent to take them to trial on the variety of contrived offenses with which they were charged.” Hoover recommended this campaign of deliberate false arrest as being the sort of “neutralizing” method he had in mind for black activists, and then ordered each of the 41 field offices receiving his memo to assign a full-time coordinator to such COINTELPRO activities within 30 days. This was far more sophisticated than merely throwing the book at people they didn’t like; for the Republic of New Africa, the FBI fanned the flames of hatred by dropping information to the local Klu Klux Klan. Next, they tried to trigger violence by raiding the RNA’s offices with guns a’blazing, and in the aftermath threw a bevy of charges against eleven members of the group. Most of which were eventually dismissed as groundless, such as those relating to murder, sedition, and treason, but enough stuck to earn their leader a twelve-year sentence. 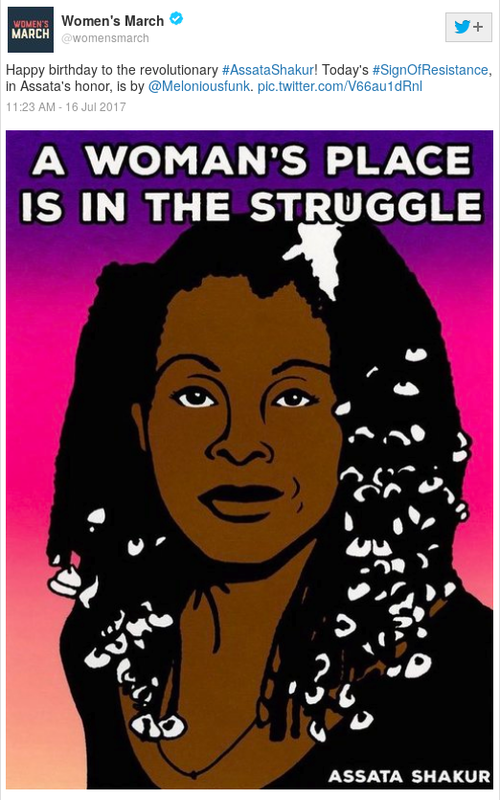 So with that background, we can turn to the case of Assata Shakur. Here’s her lawyer, Lennox Hinds, talking about the evidence for the case. … the superintendent of state police claimed that Assata Shakur took the Officer Foerster’s weapon and shot him while he was on the ground. There is not one scintilla of evidence at the trial attesting to that. In fact, as I was saying before, she was incapable of lifting her hands, much less firing a weapon. And yet despite the flimsy evidence, the police kept her chained in horrible conditions. “In the history of New Jersey, no woman pretrial detainee or prisoner has ever been treated as she was, continuously confined in a men’s prison, under 24-hour surveillance, without adequate medical attention and exercise,” said Lennox. She spent a year in solitary confinement, while the trial began nearly four years after the initial arrest. In January 1977, after years of incarceration, the case was brought before a judge and jury in New Jersey. There is much evidence to suggest the trial was not fair: transcripts of the jury selection show at least two of the jurors expressed prejudice before the start of the trial. There was evidence that the offices of the defence team were being bugged, and materials relating to her case that went missing from the home of her late lawyer Stanley Cohen were later found with the New York City police. Hinds called the trial “a legal lynching and a kangaroo court”. The defence could not get an expert witness to testify. As Shakur noted: “It was obvious I didn’t have one chance in a million of receiving any kind of justice.” She testified holding on to a photo of her daughter (conceived with fellow BLA [Black Liberation Army] member Kamau Sadiki while they were both in jail, and born in 1974). The jury reached a verdict after 24 hours – she was found guilty on all seven counts. As Hinds explained: “Under New Jersey law, if a person’s presence at the scene of a crime can be construed as ‘aiding and abetting’ the crime, that person can be convicted of the substantive crime itself.” Shakur was handed a mandatory life sentence. This is a pretty clear case of injustice, yet try telling that to the right-wing media that fixated on the surface without researching the depths. Or for that matter Laci Green, who parroted their line and turned a blind eye when someone mentioned there was contrary evidence. Salper, Roberta. “US Government Surveillance and the Women’s Liberation Movement, 1968-1973: A Case Study.” Feminist Studies 34, no. 3 (2008): 431–455. Churchill, Ward, and Jim Vander Wall. The COINTELPRO Papers: Documents from the FBI’s Secret Wars against Domestic Dissent. Boston, MA: South End Press, 1990. Pg. 103.